I’m confident most people consider wrestling a tough sport. The physical demand is complex to imagine or describe without going through it. In fact, unless you have been committed, not just involved, your accuracy is lost at sea. Wrestling is not a “work-study” experience; it’s a grind! Still there are many who give very little or just enough. If you want to succeed in this sport, you’re going to have to provide. You will understand the meaning of the words effort, sacrifice, discomfort, restraint and toughness. You will understand how much your mind speaks for your success or demise. You will understand the word fatigue; everyone experiences fatigue. The difference is the athlete who persists under fatigue vs. call “time-out.” It’s your choice – Persistent with your hand raised or time-out in defeat and a scaring of your confidence. The attitude of relentlessness will put fear into your opponents! I’ve found most athletes resist exhaustion; most will steer clear or back-off when discomfort appears. You direct how much fatigue will play a part in your success or defeats. Face fatigue when you train, not avoid it. When you maintain in spite of fatigue, you’re making an investment. The investment pays gains during competition. Remember, a habit is on the line. What will it be, relinquish or persevere? We all say “I will persevere,” but will we? 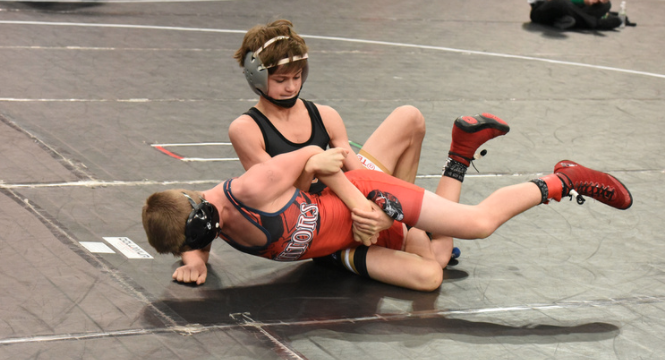 Know this – wrestling is preparation for future destitution. Since we will have plenty of hardship, it’s an advantage to choose this tough sport. Strength training is an absolute. Strength is confidence, belief, explosion, endurance, execution, defense, injury-prevention, rehabilitation, over-all foundation, and integral part of your success. I don’t care what program you use! In my opinion, it’s more about the attitude you strength train with. It’s about emotion and hustle as you cement another brick into your wall of progress. You have to be strong over and over! Your opponent will resist and oppose you while trying to force his own will. Yea, you chose a tough sport. You will have opponents who are just as strong and stronger. They will be just as prepared or better prepared. Your opponent will come after you, forcing heavy hands while trying to secure their own advantage. The window of opportunity to score is brief, if at all. All your faculties need to be in-tact. You will understand how much “feel” plays a part in your opportunity and ability to score. You will know what it’s like to change level, penetrate and hit a barrier of resistance. There’s no time to think! You have to bounce back and hold your own. You will need to continually, although under control, attack, expend energy, defend, and return to a position of strength. When you have finally learned and toiled how to stay in position, fatigue will cancel appointments with you and vacation with those who violate position. The man who employs superior position will be stronger, confident, and score or defend in an instant. Yes you chose a tough sport. You will have to break-free while underneath. From the top, you contend with his physical strength and will. From bottom your foe is gravity. You better learn “bottom’ is an active position! You cannot be passive! Beat the whistle! Learn to attack the position! See, it’s not about getting away; it’s about attacking back into your opponent. Attack! Hustle! Determined! Focused! Mind made up! You will have to keep your opponent down. He doesn’t want to wait either. It’s easier to let him go, but you’re wiser to keep him down. You have to be aggressive, bump, use your legs and hips, and keep weight on his hands. Destroy and extend his position! Keep his head down. It’s very difficult to build momentum and a foundation when your heads down. Take away his power until he has had enough, surrenders, and waves a white flag. This is a sport you’ll have to compete sore and injured. There’s always “something” nagging, compete anyway. If you only compete when 100%, you’ll never compete. If you’re sore or hurt, so what; so is everyone else. I’m not talking about being ridiculous! I’m talking about the athlete being responsible. We’re all aware of our privileges but not our duties. You have a whole team and program counting on you. You can’t just pick and choose when you want to compete. You have an obligation. You may have to compete for your state or national title under less than model conditions. You wake up some mornings and everything hurts…good! You know you’re alive. You will have black eyes and scars on your face. It’s just part of everyday practice and most wrestlers welcome it. So you have torn cartilage? So does everyone else. This may sound excessive, it is. But remember, you chose a tough sport. Learning the power of MAKING UP YOUR MIND is the most powerful tool in the human personality. As soon as you make this connection of making up your mind and committing, you save yourself miles of grief. Competition days are long. You wake up, if you sleep at all, at 5:00 a.m., weigh in at 7:00 a.m. and compete 1-2 hours later. You’re in a gym all day. You sit for several hours or return to the mat while still sweating from the previous match. You will likely never be home before 6:00 p.m. and often it will much later. The season is longer than most sports, spans two academic semesters and during hard-hitting cold and dark winter months. You will wake-up when it’s dark and return home in the dark. You chose a tough sport. And I’ve yet to speak of academics. You’re a student first, right? We hope this is the case. However, athletics and academics are both important. You succeed and learn from both experiences. Don’t ever kid yourself for a second that athletics is not its own education. Make academics and athletics a priority. You can direct and be successful at both. I’ve been in this arena my whole life and academics are NOT more important; they’re both important. What you learn and go through in wrestling cannot be taught in a classroom. People talk about an education. Competing at a high and committed level is a real-life education. They’re both important. Yes this is a tough sport and not always fun. If you want fun, join a carnival! We usually have success at things we enjoy, but it does not mean we get to avoid unpleasant tasks. Day to day is not usually filled with amusement or even great things accomplished, but it does fulfill the day to day quest. You will often not feel like doing what’s necessary. You will feel less than wonderful. It does not matter how you feel. Whatever it is, it’s temporary; it will pass. Fact is, you will have to compete on a days you feel weak, sick, and the conditions are less than ultimate. If you’re living right, you will feel better than most. It all comes down to daily choices and maximizing what you can control. Learn to maximize effort and attitude, and your victories will increase. Also, learn and exercise the power of MAKING UP YOUR MIND. This will save you a lot of dwelling time and renew your powers. Listen, you chose a tough sport. It’s not for everybody. You will do a lot to feel good for a short period of time. But let me tell you, wrestling has given many what they could not have attained anywhere else. Yea, it’s tough and filled with adversity, but trouble can do more for a person than easiness or comfort ever could. You will be challenged and tested. You will meet some challenges and fail others. However, the sport makes more “people” than it destroys. You will get back what you put into it. Don’t blame the sport. There are no guarantees and you will not always get what you deserve. As I said, this sport has “made” ten times as many people as it damaged. You can meet all the requirements above. Does wrestling sounds like a sport that’s too much; let’s call it delayed gratification. I believe humans are made to come through. yet, know the rules up front; if you chose wrestling, you’ve chosen a tough sport. Coaches, we all know the grit of wrestling is every bit mental as it is physical. We have presentations that are ideal for your program. It’s all about the “little” things and cultivating a mental climate that will give your athlete every opportunity to succeed. We say competing is 70-80-90% mental but how much time do you and your athletes spend on the mentality necessary to compete at their potential? My presentations and one on one programs are about helping the competitor manage his / her mind and even inspired performance. Contact me today and see what I have to offer to your athletes and program. November 29, 2016 in College, High School, Youth.